CHARLOTTESVILLE, Va. — A petition submitted to Gov. Terry McAuliffe this week tries to cast doubt on the guilt of Jens Soering, a German national convicted of murdering his girlfriend’s parents in central Virginia more than 30 years ago in a sensational case with ties to the 2016 presidential race. Soering asks McAuliffe (D) for an “absolute pardon” and parole based largely on an analysis that concludes that Soering, who has type-O blood, was not the source of at least some of the type-O blood found at the scene. In the absence of hair or fingerprints, prosecutors relied heavily on the presence of the type-O blood to link Soering to the crime. Convicted of two counts of murder in June 1990, and sentenced to two consecutive life terms, he long ago exhausted his legal appeals. He has been denied parole 11 times. Soering has repeatedly asked Virginia governors to send him back to his native Germany. He had success in 2010 with then-Gov. Tim Kaine, who is now the running mate of Democratic presidential nominee Hillary Clinton. As he was leaving office, Kaine granted the request on the condition that Germany keep Soering incarcerated for at least two more years. But Kaine’s action — which he later justified as a way to save the commonwealth incarceration costs — caused an uproar and was reversed by his Republican successor, Robert F. McDonnell. McAuliffe denied a transfer request from Soering as recently as December. “We have not seen any new application yet and thus can’t comment,” Brian Coy, McAuliffe’s spokesman, said Tuesday. Earlier this month, after Kaine joined Clinton’s ticket, Republicans offered the Soering case as evidence of Kaine’s poor judgment. Kaine has never suggested that he thought Soering had been wrongly convicted, so Soering’s new claim of innocence may do little to blunt GOP criticism. Maj. Ricky Gardner of the Bedford County Sheriff’s Office, who led the investigation of the double murder, said Soering’s latest claim is nothing new. The blood tests underlying that claim are, in fact, quite old: a blood typing test performed in 1985 and a DNA test conducted in 2009. What is new is a belated comparison of the two tests, said Soering’s attorney, Steven D. Rosenfield of Charlottesville. Put side by side, the test results indicate that a male other than Soering was the source of the type-O blood, according to an analysis by an expert Soering hired. Soering was convicted in the killings of his then-girlfriend’s parents, Derek and Nancy Haysom of Bedford County. They were stabbed multiple times and their throats were cut from ear to ear. Prosecutors said they were killed because they disapproved of their daughter’s relationship with Soering. Soering and Elizabeth Haysom, his girlfriend and fellow University of Virginia honors student, fled overseas and eventually were arrested in England. Haysom agreed to return to Virginia, but Soering fought extradition. A diplomatic agreement reduced the charges against him from capital murder, for which he could have been sentenced to death, to first-degree murder. Haysom is serving a 90-year sentence for her role in the killings. She testified against Soering, who has insisted that he is innocent. The son of a German diplomat, Soering initially confessed to killing the couple but soon recanted, saying Haysom killed her parents and told him afterward. He said he only helped her run away. Soering said he initially took the blame to spare his girlfriend Virginia’s electric chair, assuming incorrectly that he was covered by diplomatic immunity because of his father’s position. In a trial that drew international attention and gavel-to-gavel coverage on local cable TV, prosecutors relied heavily on the fact that type-O blood had been found at the scene. It is a common blood type, but Elizabeth Haysom did not have it, nor did her parents. The only other physical evidence presented at the trial was a bloody sock print, which Soering’s supporters have dismissed as junk science. DNA testing was not widely in use at the time of the trial. But in 2009, the Virginia Department of Forensic Science conducted DNA tests from the case as part of a broad post-conviction testing program. Forty-two samples were tested, but 31 were too small or degraded to yield results. The 11 samples successfully tested excluded Soering and Elizabeth Haysom. But the report issued afterward suggested that those samples could have belonged to one or both of the victims; a notation said the victims could not be eliminated as sources because the lab had no reference samples of their blood. The DNA report did not note the blood type of the samples. It identified the samples by where they were discovered in the Haysoms’ house. No one compared the 1985 blood-type report with the DNA report until July, when Rosenfield began preparing to file a petition with McAuliffe on other grounds — including unrelated revelations in a forthcoming German documentary, “The Promise,” about Soering’s case. 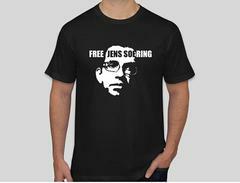 Some of Soering’s case files were in storage in Germany, because he has limited space in his cell. A friend who keeps the files for him mailed the 1985 serology report back to the United States. It showed five samples of type-O blood found at the scene. The DNA report showed that two of those five — both located at the front entrance, labeled 2FE and 6FE — were successfully tested for DNA. Rosenfield said that Shelley S. Edler, who conducted the 2009 test at the state lab, confirmed in a telephone call with him that, “as a matter of science,” Soering was eliminated as a possible source of the samples. Edler did not respond to a request for comment, but a department spokeswoman called The Post to say that Edler is prohibited as a matter of policy from publicly discussing her work. Rosenfield’s petition includes copies of the serology and DNA reports. It also includes a statement from Kenneth H. Brasfield, an assistant professor in Virginia Commonwealth University’s School of Pharmacy and an expert witness in federal and state trials. 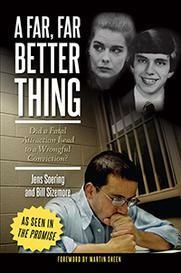 “Jens Soering has been eliminated as the type-O contributor of evidence identified as 2FE and 6FE,” Brasfield wrote. Brasfield said he could not elaborate. “There is nothing more I can say than what is in my report,” he told The Post in an email. Rosenfield said the finding is compelling evidence of Soering’s innocence. In his petition to the governor, Rosenfield also presents the findings of the German documentary. The film suggests that Elizabeth Haysom, who admitted to drug use in court, committed the murders with help from a now-deceased man who had supplied her with heroin. Soering’s defense had raised that scenario in his trial, but the film fleshes out the theory. The film includes a conversation with an FBI profiler who said he worked on the case and concluded that the killer was a woman. His report was never provided to the defense. Gardner, who appeared in the film, said no profiler was ever involved. But another investigator involved at the start of the case confirmed the profiler’s account.